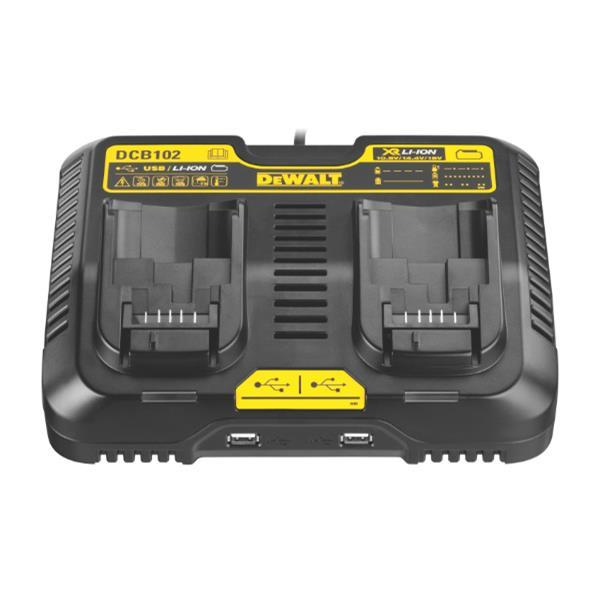 The DeWalt DCB102 multi-voltage charging station is the last word in DeWalt cordless power tool charging and is available to buy online here at DS Hardware. The DCB102 is compatible with all DeWalt XR batteries an ideal choice to have with you on any jobsite as it gives you the ability to charge 2 batteries simultaneously. You can also charge across 10.8V, 14.4V and 18V batteries which means that every one of your XR range of tools is catered for. This DeWalt charging station offers you the ability to plug up to 2 USB leads into it as well giving you an excellent level of flexibility on the jobsite and the LED indicator has a diagnostic display which shows you the battery charge status across a range of options; charged, charging, need replacement and battery temperature.